Bubbly Barchique is a full service Champagne Bar serving a variety of Champagne as well as Cava, Prosecco, Rose and other Sparkling Wines. 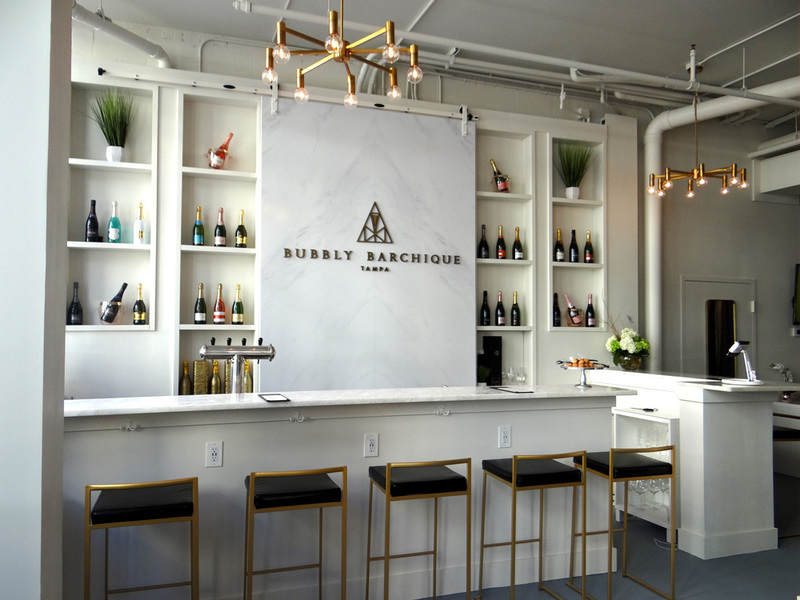 Located within Don Me Now in Tampa's Channel District, Bubbly Barchique guests are encouraged to Pop, Sip and Shop. Want to learn more about bubbles? Follow us on social media and check our calendar of events to find out when our Bubbly Basics Courses are offered. Specializing in boutique brand Champagne and Sparkling Wine's, Bubbly Barchique brings the bubbles you love and introduces you to unique brands you'll want to take home. In fact, Buy The Bottle is available for every bottle in house. Enjoy Bubbly Hour Tuesday - Friday 4pm - 7pm featuring discounted glasses and bottles. Located in Tampa's Downtown/ Channel District, BUBBLY BARCHIQUE is a short walk from Amalie Arena, Cruise Port Tampa Bay, Tampa Bay History Center, Florida Aquarium & a Downtowner Ride from Armature Works and the Tampa Riverwalk. After sipping and shopping, check out our neighborhood bites like District Tavern, City Dog Cantina, Maloney's & Cena. Grab coffee from local favorites, Gingerbeard or Victory & check out the sites on Coast Bikes. Host your next event with us. We can curate any party to fit your needs such as a Champagne Tasting, Styling Event and more for up to 40 people. For booking inquiries, email us at info@bubblybarchique.com. *Please note: private events, concerts, hockey games, local events & more could effect hours. Please contact us to confirm or review our calendar for up to date hours. Check out monthly events at Don Me Now. PARKING - first two hours free parking in Grand Central Parking Garages. Additional street parking on 11th & 12th until 6pm. Transportation from downtown & The Heights is available through The Downtowner at no charge.